The biennial SCBWI Europolitan conference is the brainchild of Regional Advisors (RAs) Kirsten Carlson (formerly Germany/Austria), Tioka Tokedira (France), and Mina Witteman (the Netherlands). Because of the small membership of each region, the RAs decided to join forces, and the first Europolitan conference was hosted by SCBWI France in Paris in 2013. The Europolitan conference invites U.S. and international publishing faculty, so it does not duplicate the SCBWI British Isles Winchester conference. Workshops presented by PAL (published and listed) members are a strong focus. 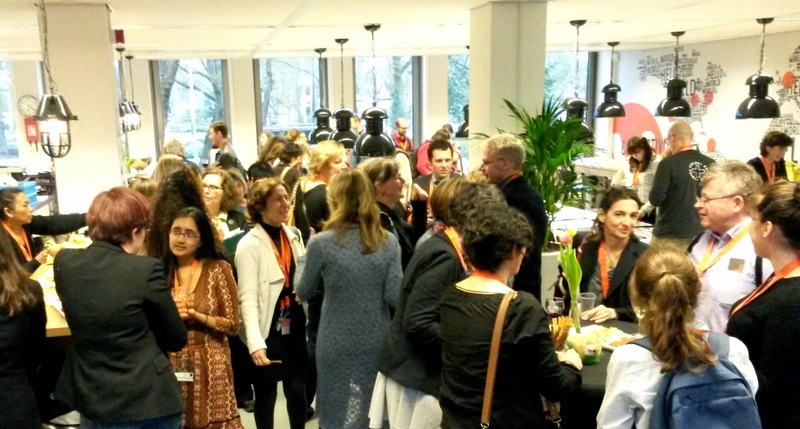 Seventy people attended the conference, hosted by the Netherlands region and co-organized by Tioka, Mina, and Dina Von Lowencraft (RA, Belgium). Delegates, conference staff, and faculty came from as far away as Japan, Australia, Turkey, Sweden, and the U.S., with the rest either local or from around Europe. 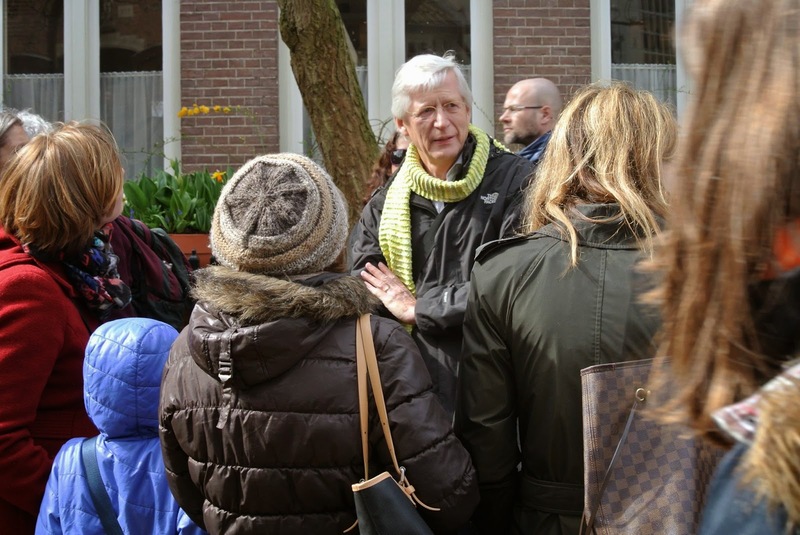 History with Professor Dirk Tang, the "walking encyclopaedia" of Amsterdam! Friday started with a Scrawl Crawl/guided tour with historian Dirk Tang, and then dinner to meet other delegates before the conference. The regional team members met at the venue for final preparations. Saturday and Sunday, there was a good balance of keynotes, panels, breakout sessions, and intensives (Sunday only), with coffee/tea and lunch breaks in between. Saturday finished with a cocktail party and illustrator gallery. Sunday included an Easter egg hunt, and the end of the conference was dedicated to awards, Undiscovered Voices, regional roundups, and parting words from Tioka and Mina. Monday ended things with a Peer Critique Brunch organized by Jane Warren, and then a Meet My Book session at the American Book Center, with readings by Dee White, Amber Lough, and Angela Cerrito from their books. Delegates had the option of signing up in advance for one-to-one manuscript or portfolio consultations with a faculty member: Martha Rago (Creative Director, Random House/Golden Books Young Readers Group), Brooks Sherman (Agent, the Bent Agency), Jill Santopolo (Executive Editor, Philomel Books/Penguin Young Readers Group), or Marietta Zacker (Senior Agent, Nancy Gallt Literary Agency). They could sign up for a career consultation with the wonderful Esther Hershenhorn (RA Emeritus, writer, teacher, coach) and/or for her Sunday Intensive. While I can’t give you a blow-by-blow of every event, I can give you some highlights from the sessions I attended. The theme of this conference was Creativity in Bloom: Growing Beyond Boundaries, which generated discussions about diversity, multiculturalism, translation, breaking down geographic and cultural borders, and creating work that challenges and validates a wider range of perspectives from children to adults. 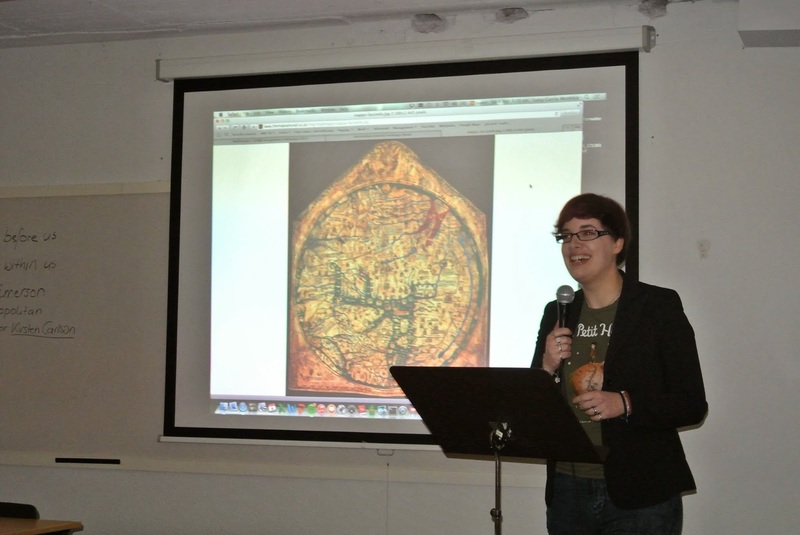 Marieke Nijkamp gave the keynote speech: Here Be Dragons! The panel Diverse Voices, Diverse Worlds confirmed that diverse books are evolving from being “issue” books to books that contain diversity. Diverse books provide “windows as mirrors” said Jill Santopolo. Two points caught my attention. If you’re researching to write about a disability, you need to talk to people who have the experience. The other point, made by Laura Watkinson (translator, the Netherlands), was that translation needs to be introduced more often into the diversity conversation. Sixty to seventy percent of books in the Netherlands are translations, compared to only three percent in the UK. The What Editors Tell Their Sales Force and How it Helps Authors Think About Their Books breakout session by Jill Santopolo was interactive, so we got to write the keynote, in-depth description, and other blurbage that is provided to a sales team. Understanding the selling points and hooks could help when writing your query letter. I thoroughly enjoyed Sandra Nickel’s (writer, Switzerland) Antagonists session. She recommended the book Save the Cat! by Blake Snyder. We went through the 13 antagonists archetypes and discussed them. We had exercises and discussions to do, which made it more challenging and fun. The final session I attended on Saturday was The Lost Plot with Mina Witteman. In smaller groups, we had to find the 15 beats in a story, which Mina uses to find plot holes. We were given picture books to analyse! We were all keen to analyse our own stories after that. Sunday morning, Özge Tigli Tasli (Illustrator Coordinator (IC, the Netherlands) dazzled us with the Fairy Tales in East and West keynote, showing how stories from around the world can be different but also the same. The fan favourite was Snow White with seven hunky men instead of the usual dwarves! The panel Publishing Here, There, Everywhere with industry experts included a discussion about the global children’s book industry, and the Bologna Book Fair and what happens there. Majo de Saedeleer (OMundo) told us about the OMundo project and showed us a selection of international books that were provided to schools to help immigrant children feel included. The panel also talked about the value of books in translation and publishing across borders. SCBWI has a new Translator category. You can also join the Society of Authors (UK), Expertisecentrum the Netherlands, or Expertisecentrum Literair Vertalen (the Netherlands). 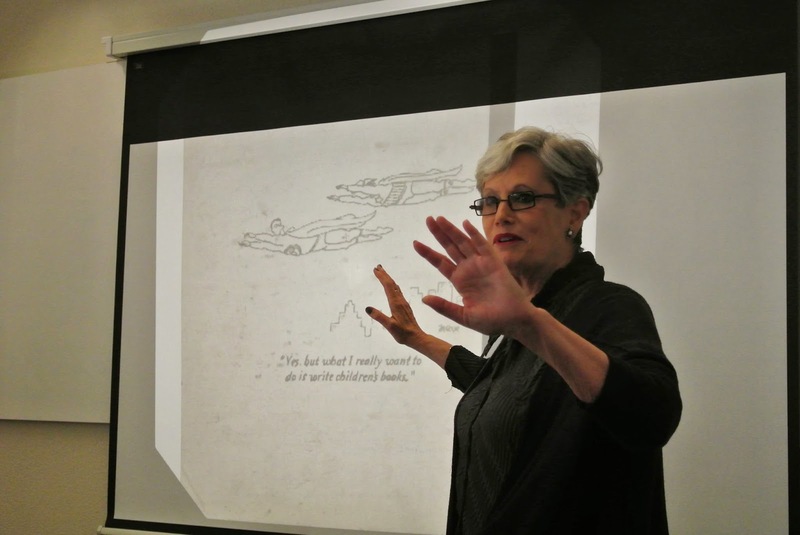 Waging War with Dee White (writer, Australia), was about adding conflict to your story. “Conflict should be reflected with action, reaction, and more action.” We went through ten tips for creating conflict, and a key point for me was “obstacles should increase in intensity throughout the book”. Brooks Sherman gave an entertaining Writing a Gripping Opening session. He read a few of his favourite openings and a few volunteers read theirs, and we discussed them. The most important thing your opening needs is a balance of “world building, plot development, and character development”. Brooks also advocated “starting where your story begins instead of starting in the middle of the action”. The closing keynote Tackling Taboos and Cultural Sensitivities was presented by Greet Pauwelijn (Publisher, Book Island). 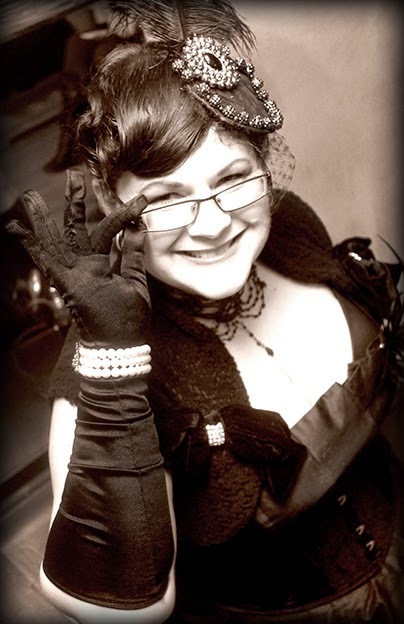 She gave examples of taboo topics and books that successfully dealt with them. She strongly advocated that we “write UP, illustrate UP, and publish UP”. I believe she meant that books, especially picture books, can be more complex and multi-layered, as every reader is capable of taking what they want and need from the story. There were pop quizzes and door prizes handed out over the weekend. At Sunday’s Easter egg hunt, Michael Schultheiss (writer, Germany) found the golden egg, and won a year’s SCBWI membership courtesy of SCBWI France. Maria Bogade (RA, Germany/Austria) organized the Portfolio Showcase Contest. Sanne Dufft (writer/illustrator, Germany/Austria) won. Monika Mitkute (illustrator, Ireland) and Gabriela Nicole Gonzalez (IC, Belgium) were the runners up. First Pages: Picture Books winner Amy McGriff (writer, the Netherlands) for Balloons. Humour Prize winner Tjibbe Veldkamp (writer, the Netherlands) for But Before That. First Pages: MG/YA winner Jane Warren (writer, the Netherlands) for AKA Madonna. Diversity Prize winner Katia Novet Saint-Lot (writer, France) for River Flow. The conference committee this year included Mina, Tioka, Elisabeth Norton (RA, Switzerland), Patti Coughlan Buff (ARA, Germany/Austria), Dana Carey (ARA, France), and Özge. Dina was unable to attend due to a knee injury. Thank you to the committee and volunteers, including dedicated photographer Tess Krüs (former IC, The Netherlands), who helped out before, during, and after the conference! It was an outstanding weekend. .
A special shout out must go to the amazing venue staff at 42, which is the home of an Amsterdam-based Internet company. They worked tirelessly all weekend to ensure things went smoothly. This conference would not be as good as it was without the incredible efforts of the faculty. Thank you to the industry professionals Marietta Zacker, Martha Rago, Jill Santopolo, Brooks Sherman, Greet Pauwelijn, Majo de Saedeleer, and Omar Curiëre, and to the PAL presenters, keynote speaker Marieke Nijkamp, Esther Hershenhorn (RAE), Rachelle Meyer (International IC), Sandra Nickel, Mina Witteman, Özge Tigli Tasli, Laura Watkinson, Elizabet Vukovic, and Dee White. Great write up Colleen. 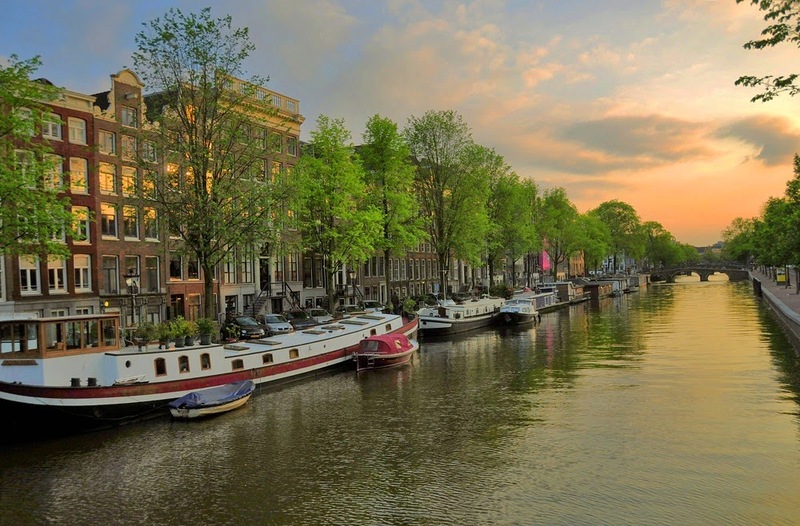 The conference sounds wonderful, I would have loved to have been there (especially after seeing the beautiful photo of Amsterdam!). Colleen, this is a fantastic write up :) Having been to both the Paris and Amsterdam conferences I would highly recommend you try to get to the next one in Belgium. The smaller number of delegates from such a wide range of locations gives the conference a real international flavour and a great opportunity to network as you learn. The highlight for me was Esther Hershenhorn's intensive Sunday workshop, I came back with pages of notes to help me with my WIPs. It really was a fun and extremely inspiring conference. Hi Catherine! Yes, I am definitely planning to attend the next one in Belgium! The bigger SCBWI British Isles Winchester conference is wonderful, but it's nice to have this alternative every second year. I really liked the smaller numbers and the interactive workshops. We're very lucky to have these events in Europe! This is fabulous, Colleen - a real inspiration. I am definitely keen to try out the one in Belgium now. Thank you! Definitely, Nancy! I loved this conference and also the annual one put on by SCBWI British Isles. We're lucky to have these events in Europe! Some of us have meetings to attend to in a weekly basis. Some of us have special occasions that we need to attend to every week. It would be great to have the best conference and meeting rooms to conduct your meetings.